Vladimir Guerrero is in police custody following a bar brawl in the Dominican Republic. Reports out of the Dominican Republic are saying that Guerrero was involved in an all-night police chase after the incident in question. The 37-year-old is currently at a police precinct in Bani and will be reportedly be charged with physical and verbal assault of an authority. What is it about ballplayers named Guerrero? This guy is so fun to watch. (Real-time first-to-home at 00:40). Unbelievable speed. He has to be the fastest guy in the league. Been a Home Run Derby in the Baltimore/Toronto series so far this weekend. 10 combined homers over the first two games. All I know is that my O's are sitting alone in first place atop the AL East and I am going to enjoy that while it lasts. Not for very long I am sure. Hey I love my O's but am also realistic. 3 of their 5 wins were at home against the lowly Twins and we were then swept at home by the Yankees. Not going to be able to make much noise if we can't win a series at home against the big guns of the division. Just give me a season where they stay competitive and in the hunt. That's all I ask. Back in October, a squirrel invaded Busch Stadium during the St. Louis Cardinals run to the 2011 World Series. Fredbird let it live out of kindness, and the rodent would become so popular, it took the place of Skip Schumaker on one of his baseball cards. 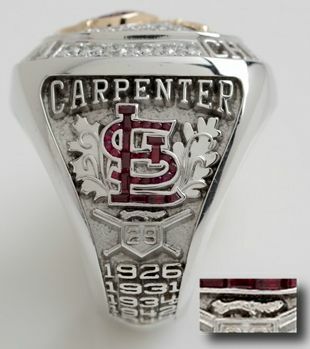 Finally, the mascot has been immortalized for all time on jewelry commemorating the Cardinals 11th world championship. This is not satire: The Cardinals made "The Rally Squirrel" part of the design of their World Series rings, which they received on Saturday. You can clearly see it in the photo, under the "StL" logo and above the crest of the bats and home plate with Chris Carpenter's No. 29. If Schumaker thought a squirrel on his baseball card was "ridiculous," what must he think of the rodent on the most symbolic piece of bling a ballplayer can own? We love our small animals! Red Sox manager Bobby Valentine, on WHDH's Sports Xtra show Sunday night, said Kevin Youkilis isn't as into baseball as he has been in the past. Youkilis: "I go out every day and play as hard as I can -- take every ground ball in the morning, take every at-bat like it's my last. I don't think my game has changed at all. ... That's just not how I go about the game of baseball." Dustin Pedroia has come to his friend and teammate's defense, telling the media Monday, "I really don't know what Bobby is trying to do but that's not the way we go about our stuff around here." This is a situation that has great potential to turn even uglier. Youk is not in Monday's lineup. Yeah, that's the way to motivate a veteran player. Not very many teams are hitting well, the Phillies have had 2 good innings so far this year, the rest have been pretty pathetic offensively, the few guys that are hitting are getting mostly singles so aren't scoring because they haven't been able to put hits together. The nice thing about those seats is that you have a roof over your head if it rains. Also if it's super warm the sun will be behind you and not in your face like it is along the first base line. First appearance of lobster Halladay last night. He was pretty pissed about the strike zone, by the 6th inning even the back of his neck was red. The score doesn't really show it but he barely held off the Giants, got in serious trouble several times. The radio guys started the game joking that maybe the Giants have so many errors because they have a tough scorer, by the end they were laughing about it being true. Some really hard plays were called errors. My O's finally got some late inning run production last night and turned a 4-2 deficit in the top of the 9th into a 10-4 win in 10 innings over the White Sox. Things are looking a bit optimistic for them, if we can only get Brian Matusz to start pitching like he belongs there. I think he has 10 or 11 L's in a row dating back to last season. I dread it when he starts. Anyway, the O's are tops in the AL East and 3rd overall in the AL. I will enjoy that for now. Baby steps... baby steps. Frack, no decision for Lee, Phillies lose in the 11th. Have I mentioned that I can't stand Bobby V? Godzilla and all other Japanese residents agree.